Cute Neptune blocks! Watching how they will come together! I have a shoe box full of 3" nine patch blocks that I inherited from a friend. Still trying to figure out how to use them! Thanks for sharing yours! Love the blocks. Glad summer family time is taking a first row seat. They'll be grown before you know it! Enjoy. Lovely! And such a great fabric line! Can't wait to see where this goes! 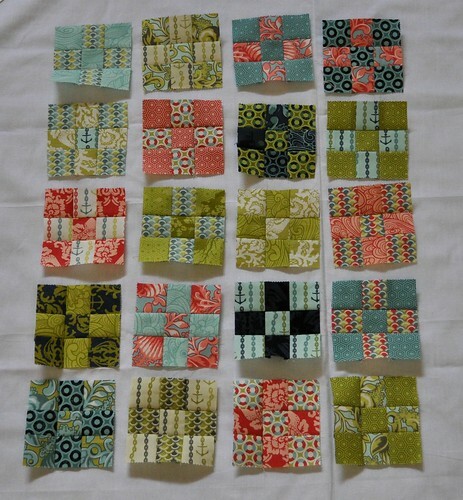 These are great 9 patch blocks! Your blocks are very pretty! I look forward to seeing what you do with them. I recently helped my grand-daughter do the 9-patch and we cut them to a disappearing 9-patch. The quilt came out beautiful after trimming them down, and we did it in 2 days!! I was so tired when she left. I am loving summer this year.